Are you hungry for investment or partnering opportunities in the foodtech industry? 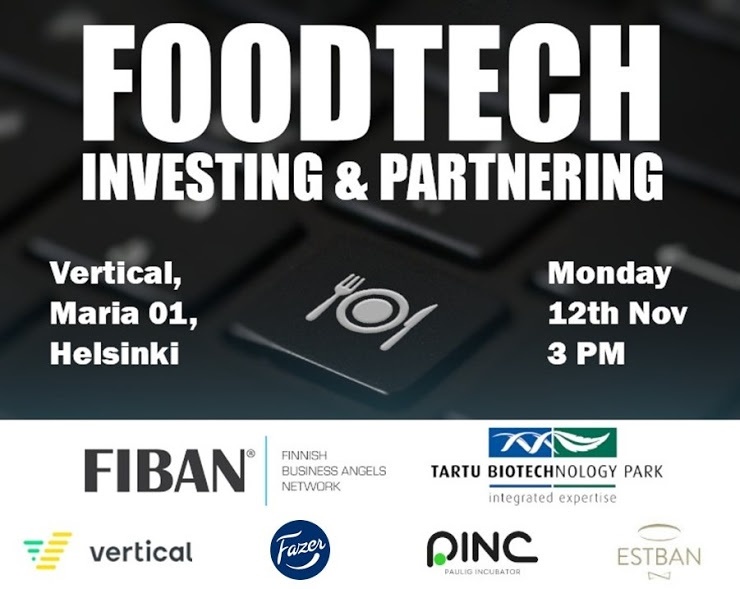 FiBAN and Tartu Biotechnology Park in collaboration with Vertical, Fazer, Paulig Incubator (PINC) and EstBAN invite investors and foodtech innovators to an exclusive investing and partnering seminar. Come, familiarize and get excited about the transformation of the foodtech industry. Pick up the delicious tips from experienced investors, and learn about sweet investment opportunities. We will feed you with insights, inspiration and business contacts! This will also be the first day of the international Business Angels Week. Start it with tasty topics and great company, such as Saga Forss (business angel), Päivi Juolahti (Head of Fazer Lab), Marika King (Head of Paulig Incubator – PINC), Reidar Wasenius (Managing Director of FiBAN) – and many other professionals in the field.